But there's a problem. You will notice several differences from our previous work-ups, but let's just point out the key ones for now and wait for the dust to clear for the rest. Shelley Duncan is with the Rays because of the Rays' Luke Scott going on the disabled list for a couple of weeks, and, because he and a pitcher named Jamey Wright were added to the 40-man roster, two guys had to be dumped (aka, "designated for assignment"). They would be Robinson Chirinos and Steven Vogt. They will have to clear waivers before they can be assigned to the Bulls. If they do make it through then we'll see more changes. Before Thursday? Don't know. In the meantime, you will see that Craig Albernaz is on the roster. Expect the roster to be available on the Bulls website within the next few minutes. The International League's preview is a useful link to have at hand for the first several games this season. They seem to think that Matt Buschmann has a shot at the Bulls starting lineup. I can't disagree with that. I just don't know who might fall out. Maybe Torres in relief. Also, they've got Fontenot at 3B. Maybe. But then there's this link from the IronPigs that's truly bizarre. I'm not sure we should take it seriously, but, if true, it should give guys something to do between beers in Phillies country. Update: Apparently hands-free (sort of) video gaming in Pennsylvania is for real. See the Allentown Morning Call for more. We saw a good bit of Gimenez last year and like him a lot. Some reports imply that he is actually a better catcher than Jose Lobaton, the Rays #2 catcher, and that he’s only in Durham because of how the business of baseball works. We’re happy to have him here. His numbers as a Bull last year are very impressive. Also, don’t be surprised to see him playing other positions. Robinson Chirinos hasn’t worn a Bulls uniform since 2011. His year away from the game on the disabled list has left a bunch of question marks. At 29 he is running out of time. We’ve seen a lot of Steven Vogt and we like him. Catcher, outfielder, first baseman, he’s been snakebit at bat for the Rays, but not for the Bulls. The catcher missing from the roster is Craig Albernaz. This very durable young guy recently got his first hit after a bunch of major league spring training camps. Expect him to be sent to wherever the Rays think young pitchers need some help. Still probably the best arm and release time of any catcher in the Rays system. I hope we get a chance to see him at work here in Durham this year. Overall, the Bulls should be solid behind the plate this year, until problems erupt in St. Petersburg. Cole Figueroa, Tim Beckham*, Hak-Ju Lee*, Mike Fontenot, Leslie Anderson, Shelley Duncan, Shawn O’Malley. This list implies that the Rays are pretty satisfied with their infield lineup, since only two players are on the 40-man. Not sure I agree with that assessment, but then this isn’t a Rays blog. Nor am I sure that O’Malley with start with the Bulls this season. Hope so, I like watching him play. Cole Figueroa is simply a real pro. A very important part of the 2012 Bulls and, as far as I can tell, the only experienced third baseman on the roster. That worries me that we have only one. We’re familiar with Tim Beckham. Looks like he may be moving over to 2B to give newcomer Hak-Ju Lee some time at shortstop. Mike Fontenot is a newcomer to the Bulls. Good reputation. We all know Leslie Anderson. He had a great spring with the Rays, but not enough to get him onto the 40-man. Expect to see him spend time at 1B, left field, and DH this year. Shelley Duncan brings some serious power to the Bulls. He stuck with the Rays all spring long, but just couldn’t crack the 40-man. 1B, DH. Shawn O’Malley is a fast, quick-handed infielder. Terrific baserunner. Hope he can stick with the Bulls. Wil Myers is the up-and-coming star prospect in the Rays season. A good reason to catch a couple of games early on, because he probably won’t be with the Bulls very long. Brandon Guyer is coming back from injury. He had a terrific 2011 with the Bulls. He is major league quality player. Rich Thompson is one terrific ballplayer who can’t quite seem to stick in the majors. Great to have him back with the Bulls. Jason Bourgeois has a lot of major league time (222 games). Not quite sure how he fits with either the Rays or the Bulls. We’ll have to see. 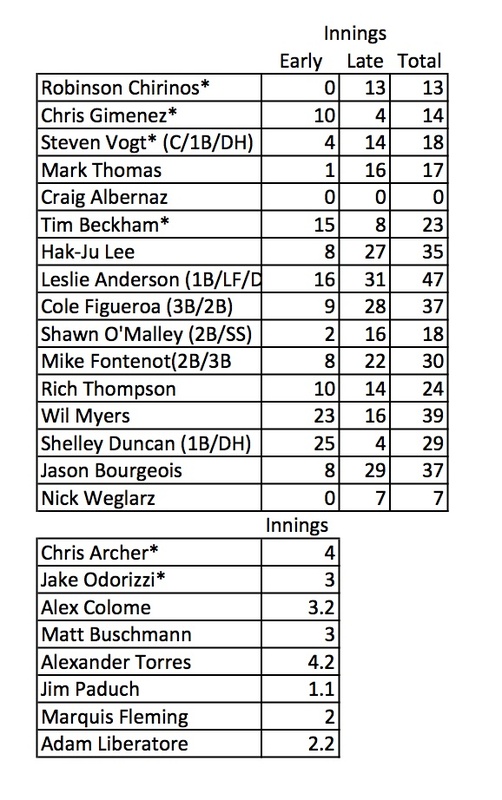 Basic arithmetic says I’ve got something wrong here since the Bulls usually carry no more than 13 position players and I’ve got 14 on this list. That won’t stop me from commenting, of course. This looks really, really good. There’s power, gap hitting, lots of speed, good arms in the outfield, and a terrific-looking “diamond” — catcher, 2B, SS, CF. I’m modestly concerned about 3B, but otherwise the gloves look good. 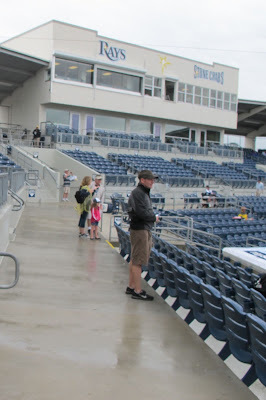 In 2013 the first home game (April 8) against the Gwinnett Braves is five games into the International League season. The Bulls start their season at Norfolk against the Norfolk Tides on April 4. The last home game (August 27) is against the Charlotte Knights, but the Bulls will have five more away games before the season ends on September 2. A very important feature of the schedule is that the Bulls only play 8 games against each team outside the South Division, 4 at home and 4 away. That means that if you are a Boston fan the only chance you’ll get to see Red Sox prospects will be July 18 - 21. That’s it. They won’t be back unless both teams are in the playoffs in September. The same is true if you’re a Yankees fan (May 31 - June 3), a Reds fan (June 17 - 20), or a fan of any of the other parent clubs of teams in the North or West divisions of the International League. Said another way, the Bulls only play 40 games at home with the teams from outside the South Division. The Bulls have a 9-game home stand in August, but home stands usually run 4 - 8 days. Road trips are often 8 days long, but sometimes they are shorter. The Triple-A All-Star Game pitting the International League All-Stars against the Pacific Coast League All-Stars is set for July 17, well past mid-season, and will be played at the ballpark of the Reno Aces out in Nevada. Exactly how the players are selected for the game is something of a mystery. Fans do get a vote; however, usually the IL doesn’t bother to tell us how the voting went. The 2014 All-Star game is to be played at the DBAP. The International League Championship (The Governors’ Cup) is decided with two rounds of best of five playoffs in September. A one-game “AAA Championship” game is to be played at the home ballpark of the Lehigh Valley IronPigs on September 17, 2013. The Durham Bulls, as all readers of this blog must know, won the Governors’ Cup and the AAA Championship in 2009 and has won the Southern Division five of the last six years. Every major league team consists of 25 players on the “active” roster. Those are the guys in the games and in the box scores, traveling in chartered airplanes, and making a decent, sometimes obscene, amounts of money. An additional 15 players are added to make up the 40-man roster. In general, once a player makes it to the 25-man active roster he stays there (unless traded, sold, or designated for assignment). For players who have been around for a while, there are all sorts of byzantine rules regarding how this works. To complicate matters, last year the rules were changed allowing the major league teams to expand their roster to 26 on days that they have a double-header. What matters to Bulls fans, however, is that a Bull cannot be called up to play in a Rays game (even to temporarily replace an injured player) unless he is first on the 40-man roster. If previous years are typical, we can expect that 11 to 12 of the players on the 40-man will be assigned to Durham and they will probably be split about 6 or 7 pitchers and 4 or 5 position players. Players on the 40-man who aren't with the Bulls are oddities a bit difficult to explain and don't really make that much difference to us. Mostly they are playing at AA and lower levels. Of the pitchers, one or two will be prospective starting pitchers, the other potential relievers. Fairly often when WDBB writes about a Bull we will mention whether or not he's on the 40-man. 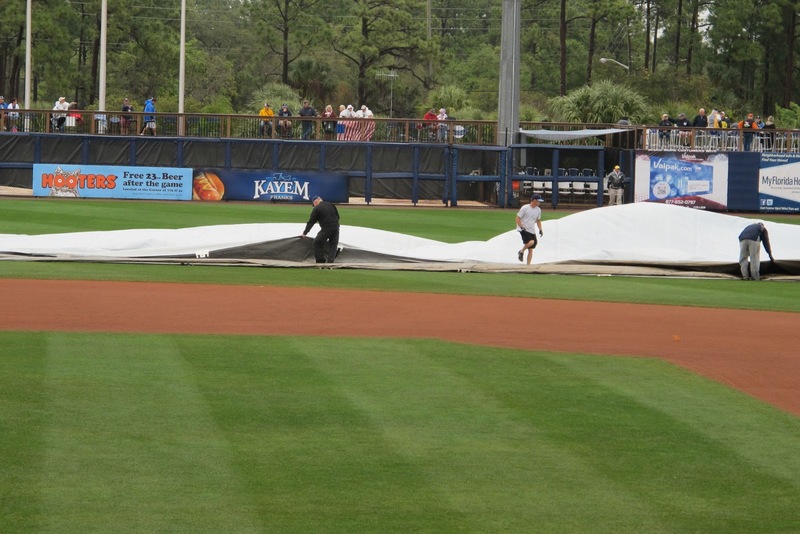 My point is that sometimes what we see on the field is often decided in St. Petersburg, not in the Bulls’ clubhouse. 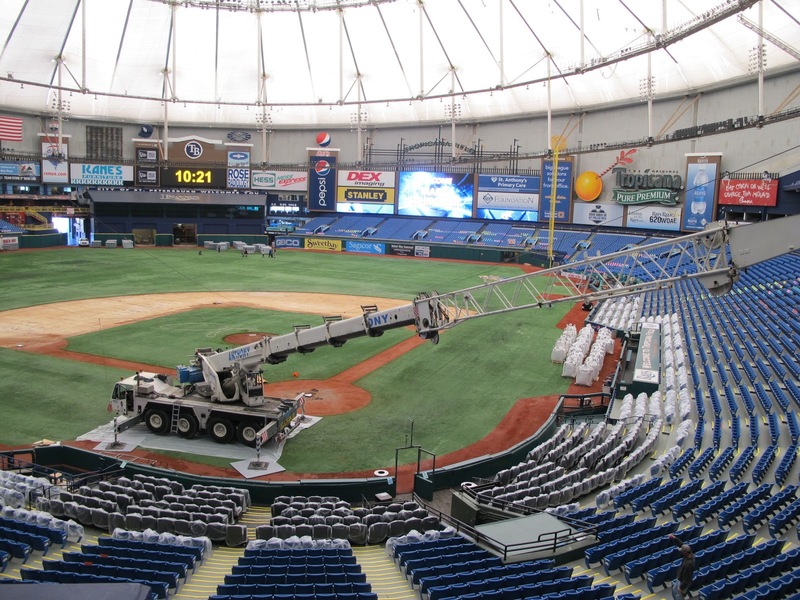 The Rays really aren’t particularly interested in the Bulls’ won-loss record. So, we will inevitably see some unfortunate (for the Bulls) decisions, such as a player being called up, sitting on the Rays’ bench for a couple of weeks, then coming back to Durham with his timing shot and struggling at bat. And with this new 26 man roster for double header rule, Bulls’ pitching rotations can get really screwed up with a pitcher being called up for a spot start and then coming back. For WDBB's and other views on who are the Great Triple-A Durham Bulls see this post and this one and another from earlier this year. The season opens soon and I’m thinking that fans will be looking around the web for information about the Durham Bulls. So here’s WDBB’s contribution. I hope that it doesn’t come off as too basic, but this is mostly stuff I did not know when I became a Bulls fan. Triple-A baseball is one step below major league baseball. How do we know that? Because Major League Baseball says it is. Logic would say that since AAA is the next step down from the majors, the teams would like to be in close proximity to each other. Sometimes that’s true. Toledo is linked to Detroit, Pawtucket is the AAA team of Boston, and the Atlanta Braves AAA club is just a long taxi ride away in Lawrenceville, Georgia. On the other hand, Charlotte is pretty far from Chicago and the Durham to Tampa Bay distance is a good bit more than average. Let's not talk about the distance from New York (Mets) to Las Vegas in the PCL. Obviously, all the teams in the “International” League are in the US, but up until recently there was a team in Ottawa. That gave us the chance to sing along to “O, Canada” four times a year. You can bet that someday — maybe not in my lifetime, but someday — The IL will have a team back in Havana (they had a team in the 50's), San Juan, or Mexico City. With teams from both the National and American Leagues, what about the designated hitter rule? In the International League the only time pitchers go to bat is when both clubs are National League affiliates. That means that no Durham Bull pitchers will go to the plate this year (except in the very weird circumstance where a pitcher could go to the plate as a pinch-hitter — not likely, but possible). The league offices are in Dublin, Ohio. Update: Somehow I missed the deal that Buffalo made with Toronto. The Mets AAA team will be in the PCL (Las Vegas), while the Blue Jays will be able to whistle up a limo to bring a reliever in (assuming he has his passport with him). The Bulls own website provides some solid speculation on the possible members of this year’s roster. I don’t bet on sports, but it was naive of me not to realize that some the sabermetric crowd would try to use their ideas to make money. They have. A new book on the process is here, and Grantland has a story here. It seems like a very long time since we’ve heard from Nicole Johnson, wife of (or to) Elliot Johnson) and a blogger of some astuteness. Recent posts to her blog offers two views of a trade from the perspective of a wife. Here and here. If you want to see the entire International League schedule in one place, take a look at this matrix schedule. It begins to look like the peculiarities of the business of baseball are going to provide the Bulls with a first-rate catcher … but we recall that although Chris Gimenez reported to Durham at the beginning 2012, he went back to St. Pete before the Bulls season even started. Rays Index has updated his playing time table. Several roster clues in there. I’m back home to North Carolina with mixed feelings about our trip to Spring Training. We saw three games, but I regret to say that the baseball simply wasn’t that interesting. 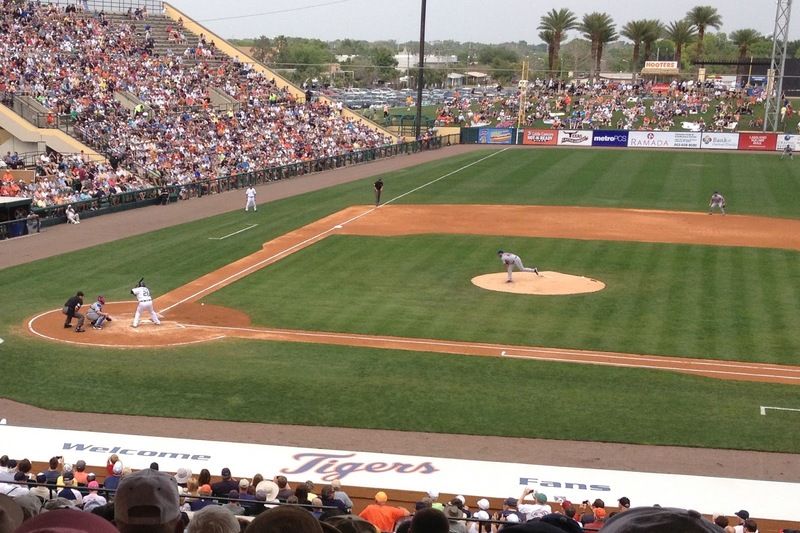 The games were the Detroit Tigers-New York Mets, Tampa Bay Rays-New York Yankees, New York Yankees-Philadelphia Phillies. We knew that at this point of pre-season the regulars were only playing a few innings and that winning/losing wasn’t all that big a deal. However, knowing it intellectually and experiencing in the stands are two different things. For example, after the 5th inning of the Tigers/Mets game about six of the big names came out of the dugout and strolled off to the gate in right field, jerseys pulled out of their pants, laughing and telling jokes. Their day was over. I get that, but couldn’t get used to it. What was missing, from our great distance up in the stands, was intensity. At an individual player level, for those without an assured spot on the roster, I am sure each pitch and each at bat was very important. For teams other than the Rays/Bulls, I just didn’t know enough (and found it hard to find out) to tell who’s career was on the bubble. A Bulls fan can’t help but compare the parks to the DBAP. None of them even come close. I realize it probably isn’t a fair comparison, since these stadium are used mostly for Single-A ball the rest of the year. Seems to me fans are being gouged when they pay top dollar for not very good seats. Our tickets were all above $20 and that paid for seats pretty far away from home plate. In design, the Yankees field in Tampa came the closest, but still a distant second place to the DBAP. On this tour, we got a good bit more than baseball on the field, including the previously mentioned visit to Tropicana Field and some remarkable presentations by an exceptional baseball expert, Coach Bill Mathews of Eckerd College. I’ll probably be using several of his insights into the fundamentals of baseball and baseball scoring as the season goes along. So, yes, I did get to see many, many players that I would never have seen in person. I learned a bit more about the game. I met some terrific people (even if many of them were Yankees fans). 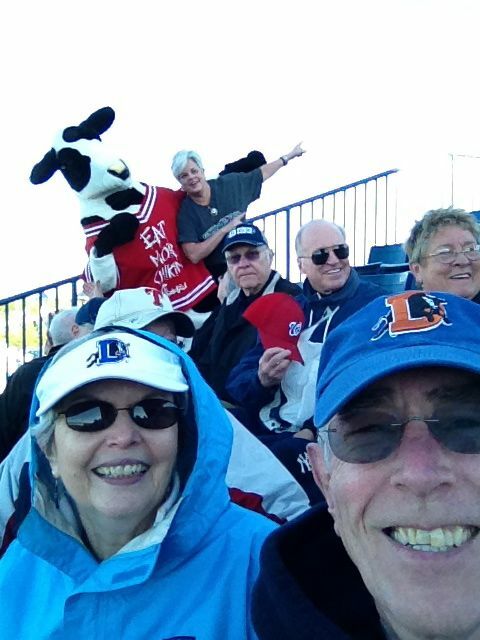 We even met another couple who were from Pittsboro and Durham Bulls fans! Did we enjoy it? Yes. Would we do it again? Probably not. For pure, top quality baseball in a pleasant, affordable environment, the short trek to the Durham Bulls Athletic Park on a summer night is a much, much better experience. But the waiting is killing me! As part of our visit to Spring Training our group got a tour of Tropicana last Thursday. That was the first time we’d ever seen that famous venue and we were very impressed with the facility. First is the matter of scale. Driving past on the elevated highways (I-275, I-175, I-375) is somewhat deceptive. But once you step on the field, the immensity of the place is astonishing. The first photo was taken from just in front of the left field pole. Note the “cherry picker” truck off in the distance. Here’s the view from the press box, a very comfortable place to be during a game, I’d guess. Note the white bags down in front of the Rays’ dugout. Those bags are full of dirt. That’s essentially the Tropicana infield. 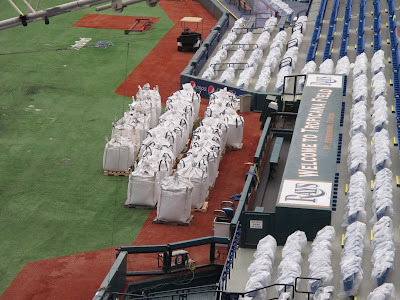 Rays management seems very proud of the fact that they use real dirt, imported from Mississippi, for the infield. 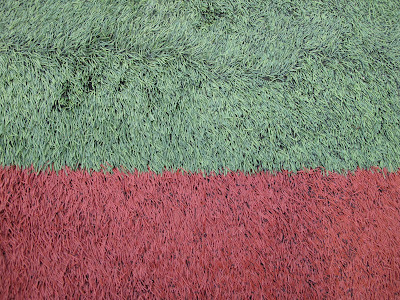 This is a closeup of the playing surface. Didn’t go running around on it, so hard to tell how it really feels. 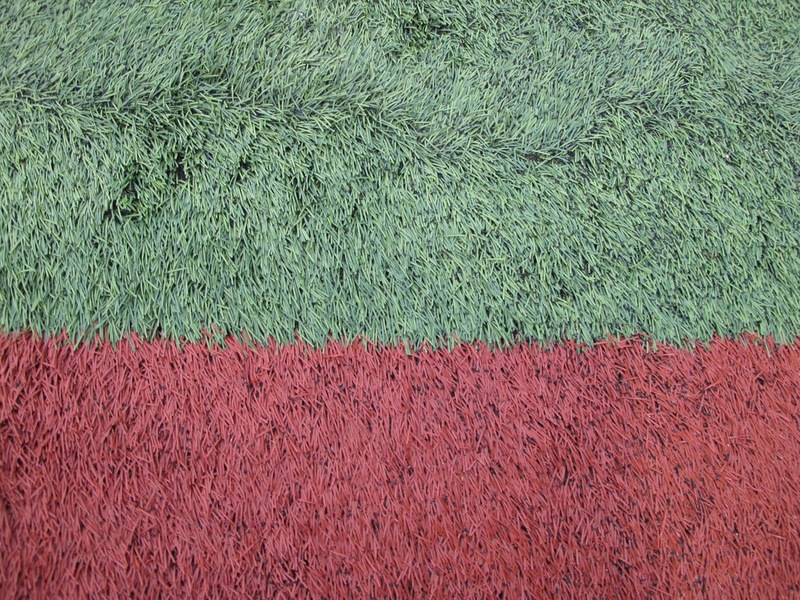 You don’t hear many player gripes about the surface, at least I haven’t heard anyone. 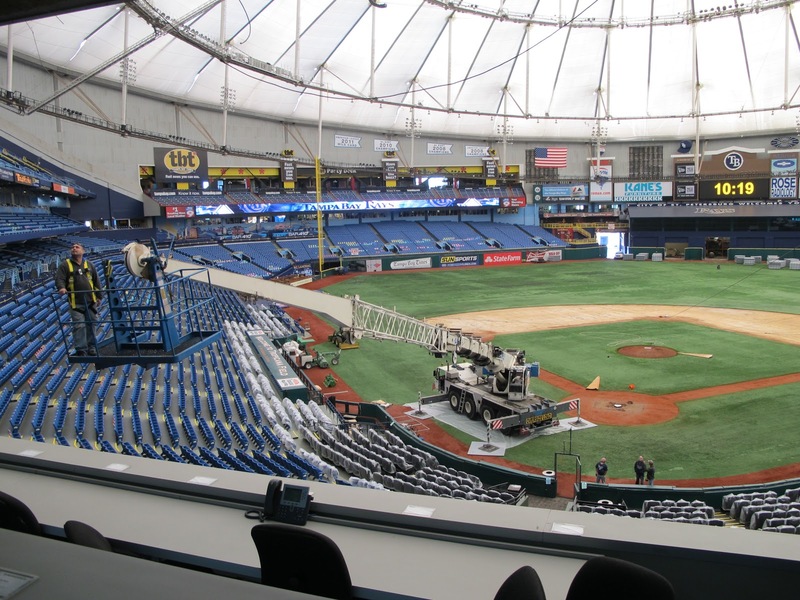 Visiting players do gripe a bit about the Trop, but mostly about the catwalks and about losing the ball against the dome. On the other hand, if you want to play baseball in the summer in Florida, I don’t see how you have any choice. I’d love to go to a game there some day. 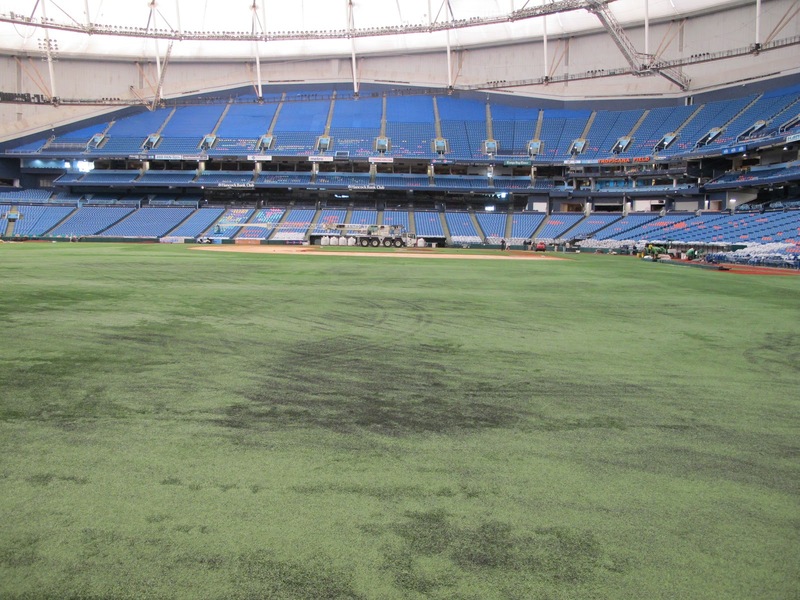 Since every other baseball blogger in the world has offered an opinion about Tropicana Field, let’s provide our own. 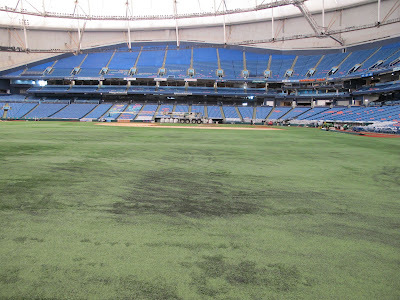 The Rays only average about 20,000 fans per game. They need/want that to get up to 25,000 or so per game and discussions about a new stadium have been floating since oh, about 1998, when the Devil Rays came to town. While we were there we approached the Trop from just about every possible direction. We came down 75, split over to 275 and on into downtown Tampa, across the bay and on down 275. We came back from Lakeland using I-4 and connected with 275 in the middle of Tampa. We visited our old home in the Valrico/Brandon area and drove through Tampa on the Selmon Expressway to cross the bay on the Gandy. 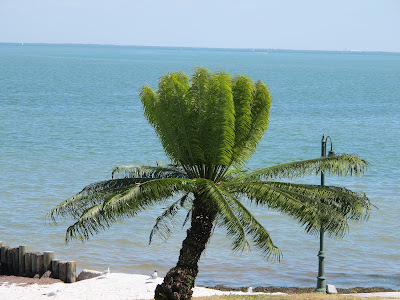 We saw a game down in Port Charlotte and came back to St. Pete over the Sunshine Skyway. None of these treks was made during rush hour. Clever marketing would probably help get to that magic 25k. Nevertheless, I don’t think a new stadium would make much difference. And if they spend hundreds of millions on a new stadium, 25k won’t be enough fans to pay the mortgage. I am sorry to write this because the Rays are a great baseball team and they deserved a great crowd each game. A new stadium? Would be fun. Don't see how it could make that much of a difference. I did like the Trop. Hope to see a game there some day. Rays need to figure out how to make it work even better. It's Florida, so the weather's changeable. But the tarp came off not too long after we got there and the game started almost on time. Alex Cobb had a very nice five scoreless innings, but that doesn't matter much to Bulls fans. Dane De La Rosa gave up three runs and five hits in his one inning. That does. Otherwise, an interesting day for a Bulls fan. We got to see several potential Bulls such as Wil Myers, Chris Gimenez, and Hak-Ju Lee, and got quick looks at several others such as Jason Bourgeois, Shelly Duncan, Rich Thompson, Brandon Guyer, and Stephen Vogt. We were particularly pleased to see Robinson Chirinos take a couple of innings behind the plate. He's using a goalie-style mask these days. I'm not sure if that was what he was using at the time of his concussion about this time last year. My guess is that he wasn't. Near the end of the game Dan Johnson took over at first base for the Yankees. He seemed to be having a pleasant conversation with the Rays' first base coach. I wish the ballpark experience was as good as the game experience. For some reason the folks at Port Charlotte seem to think that they only have to provide seating for midgets. The inexpensive (by major league standards) seats are about the most cramped I've experienced. On the other hand, it's a very pleasant place to walk around with good views of the game. Looks like Stacy Long of the Montgomery Advertiser is down in Port Charlotte as well. Time to start keeping an eye on his Biscuit Crumbs blog. So here I am in St. Petersburg and eventually we are going to get to see a Rays game, but before that we were off to Lakeland to see the Tigers play the Mets. My hope was that I'd be able to identify potential Mud Hens or Bisons, but there simply wasn't enough information available to make a guess. Instead I got to watch Justin Verlander, Prince Fielder and company get destroyed by the Mets 11-0. Verlander was really off. He gave up a couple of home runs, balked in a run, hit a couple of guys. I think he let in something like 5 runs before he left. It was fun to at least see Fielder on the field. I remain amazed that someone who looks so unlike a baseball player does so well at the game. Well, not sure he was taking today seriously. He was walked in his first AB then and then was caught stealing. That's right, caught stealing! Rays v. Yankees on Tuesday. Hope the rain keeps away. An important bit of information buried in the Phillies-Rays box score of a couple of days ago, Craig Albernaz got into the game. A bunch of players have been sent down to minor league camp. Will have to take a closer look later.